I was having visitors over for lunch one day and was trying to figure out what I was going to cook for them, when I came across this dessert. I had been meaning to make it for some time now, just never got around to it. Now when I have people over I always introduce one thing I have never cooked before. My lunch was all sorted, so I thought dessert is my new thing. I am so glad I tried this, when you put the three flavours in your mouth together it really is an OMG moment. It is rich, it is creamy, it is luscious, it is divine. Now warning do not make these big, as a little goes a long way. As it is rich, you don't want a lot of it, so try and find smaller cups to serve it in and allow your guests to enjoy every bite. Too much and it goes from the perfect dessert to over the top, so remember small is best. I may even try it in shot glasses for a large gathering. This is probably the best chocolate mousse I have ever had, it is so nice with the addition of the Kahlua. And the pannacotta, just beautiful. 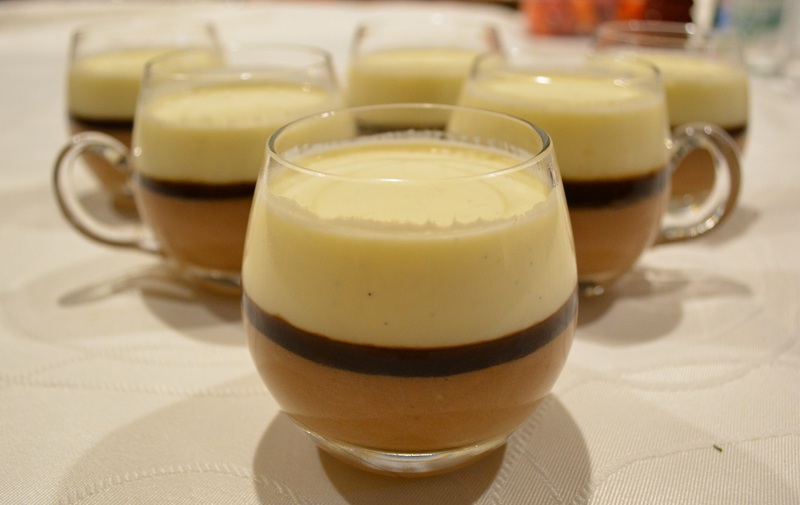 As I needed more than 6 serving of this, when making this recipe I did double the recipe for the milk chocolate mousse and it worked beautifully. I also doubled the dark chocolate fudge recipe and it also worked well. The only thing I made as per recipe and did not double was the White Chocolate Panna Cotta, I wasn't sure if the recipe could be doubled and still have the same consistency, so I just made two individual batches of it, which was easy. By doubling the recipe I actually made 15 servings not 12, as I made them slightly smaller than the recipe suggested and it was still enough. Place the chocolate in a large heatproof bowl, place the bowl over a pan of simmering water, do not allow the water to touch the bowl. Mix until melted and smooth. Add the Kahlua and the egg yolks and stir until combined. Beat the egg whites with an electric hand mixer until you get soft peaks. Add the sugar and beat until well combined, a further 2-3 minutes. Stir one-third of the egg whites into the chocolate mixture, then add the remaining egg whites and gently fold through until just combined. Whip the cream with an electric hand mixer until soft peaks, then gently fold it into the chocolate mixture. 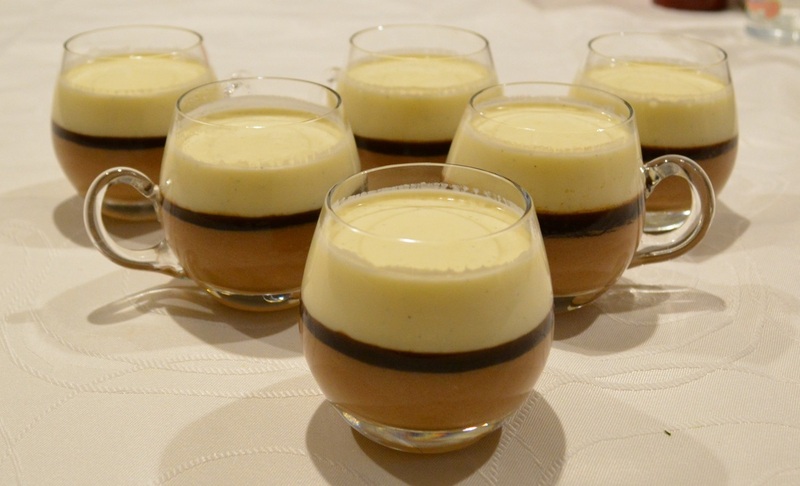 Spoon the mousse into six 1-cup capacity glasses. Cover with cling film and refrigerate for 2 hours until set. Combine the chocolate and espresso in a large heatproof bowl, place the bowl over a pan of simmering water, do not allow the water to touch the bowl. Mix until melted and smooth. Cool for 10 minutes, then carefully spoon a thin layer over the milk chocolate mousse. Refrigerate, covered, for 30 minutes to set. Combine the cold water and gelatine in small bowl, allow to bloom for 5 minutes. Combine the cream, vanilla bean paste (or vanilla pod and seeds, if using) and sugar in a small saucepan. Add the gelatine mixture to the cream mixture. Place the pan over medium heat for 4-5 minutes or until the mixture is hot, stirring constantly to dissolve the sugar and gelatine. Place the white chocolate in a large bowl, pour over the hot cream mixture and stir until smooth. Stir in the yoghurt, then set aside to cool for 30 minutes. Strain the mixture into a jug, then pour evenly into each glass on top of your chocolate fudge. Cover and refrigerate for 6 hours or overnight if time allows.